It’s come to my attention in the past several years just how important the thumb truly is! 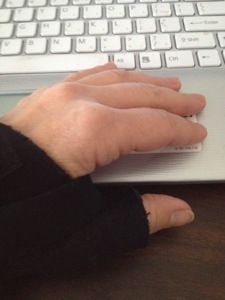 I find myself in a technical dilemma… For some reason my thumbs, yes both, have found there way to an early arthritis situation. I put total blame on my iPhone! Period!!!! Ever since I started typing my blogs and poetry on my iPhone my thumbs have been acting up. Which has me wondering… I can’t be the only one affected by this wonderful technology. And if I am having such a huge issue with my thumbs then others must be suffering too! So are you? Do you find your hands, fingers, thumbs ache out of the ordinary due to your iPhone or other technology? Well I just had two shots into basil joints on my thumbs yesterday and honestly I would have rather put my head in a vice… The pain was…Well, let me just say I never want to experience that kind of pain ever again!!! So my writing will have to be reevaluated… Although my favorite place to write is on my iPhone, I will just have to rethink this whole process!!! Gotta love my thumbs, without them I can’t straighten my hair, tie my sneakers, open a jar of sauce or even Talk on the phone just to name a few… So I say “respect your thumbs” they do so much for you in life!! !